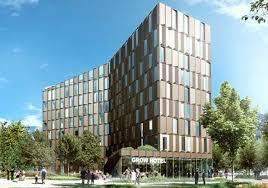 The Best Western Grow Hotel opens in November 2018 and is a four-star, modern and sustainable hotel located on the border between Solna and Sundbyberg. Great emphasis has been placed on design and smart digital solutions. Eitech has received all electrical contract and data / telecommunications on behalf of Forsen Projekt and has chosen to install Eurolan's screened C6A solution for a future-proof 10Gb transmission. The network is delivered with Eurolan's 25-year system warranty that meets all PoE standards and segregation class D.